These are the latest statistics for children relying on a benefit. They do not include children whose caregiver is younger than 18. 1/ The number of babies (0 years) relying on welfare has grown 17 percent since 2005 whereas the growth in total births has grown by around 11 percent. More people are going on welfare from the time their child is born. 2/ Many people seem happy with mothers (usually the benefit recipient) receiving a benefit when their children are very young. Yet 67 percent of the children are 5 or older. 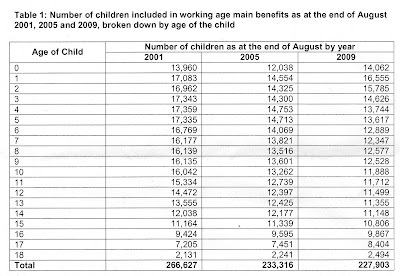 3/ The number of children on welfare has dropped since 2001. Labour made a big deal out of reducing 'child poverty'. But given the period featured record low employment and good economic growth (so we are told) the drop in the number of children on welfare was relatively small. 4/ According to NZ Statistics population estimates there are 1,149,000 children aged 18 or younger. So around 1 in 5 is on welfare. In the poorest areas this will jump to 2 or 3 in 5. That means being on a benefit is normalised and thus the tendency is towards more benefit receipt. 5/ In the 0-2 age group the ratio rises to 1 in 4 children being on welfare. That is fairly sobering stuff. I am not going to repeat what I have said previously about making pseudoephedrine prescription only here and here. And I am not going to start on about rabid authoritarianism and the slow but sure curtailing of freedoms rightly exercised by productive and harmless individuals. The model is Oregon so best just go there and read what the results have been after 4 years. Mixed and not easy to measure. Oregon became the talk of the West Coast for making pseudoephedrine, the key ingredient for illegal meth, a prescription drug. And yet you don’t have to go far to hear about how meth is still very much in circulation. Eno spent last Sunday morning at a North Portland grocery store, feeding bottles and cans into the recycling machine for some change. He’s beyond skinny, emaciated, really, his long blue jacket hanging on him like a scarecrow’s coat. He says he definitely noticed changes between the meth that’s on the street now, and what was sold when pseudoephedrine was easy to get. Eno’s talking about Methylsulfonylmethane -- one of several alternative meth ingredients you can still get over the counter. Arrests for meth production, trafficking, and possession trended down between 2006 - the year pseudo became a prescription - and last year. Even officers who were skeptical about the change admit they’ve seen a shift. They’re relieved to find fewer biohazards on crime scenes. At the same time, Jeff says the days of swooping in on meth cooks coming home from the drug store are long gone. Bill Piper “Meth labs are down, but most of what you call meth labs weren’t 'labs'. A lot of law enforcement in a lot of states, if they went to a house and someone was making meth in the kitchen sink - most cases that was for persona use – there was a tendency to call that a lab largely because they had to prove they were busting up these labs to get more money. That’s not at all a criticism of law enforcement, it’s more a criticism of the funding streams, which kind of distorted incentives." Piper says it’s a little too soon for policymakers to say whether the the pseudoephedrine law helped or hurt. There are officers around the state who say the law really cut down local meth production, which caused a slew of environmental and social problems. But others say it’s eliminated some homegrown competition for large drug trafficking organizations. There’s general agreement these groups are regaining the influence they had before the "Mop & Pop" meth labs set up shop in Oregon. Livingston says the pseudoephedrine law wasn't a bad idea, but it hasn't really made meth less available. Her counselor, New Step Director Maria Couch, agrees she's not seeing fewer meth addicts either. Maria Couch "I have not. I don't see that the numbers have dropped at all." Addicts are taking advantage of meth made out of state, or meth made without pseudoephedrine at all. The year the pseudoephedrine law was passed, 15,000 people sought treatment for meth at state-funded facilities. Last year, that number was closer to 11,000. That's 4000 fewer people. So did the stranglehold on meth ingredients lead to lower addiction rates? Not exactly. There were plenty of people who needed treatment for meth abuse, but didn't get it, because there wasn't enough money to pay for it. Karen Wheeler runs Addictions Policy and Programs for the state of Oregon. She says funding for treatment of all addictions has actually dropped by tens of millions of dollars, in the years since the pseudoephedrine law was passed. “I support Ngati Manawa’s call for help to address the cultural dislocation and disconnection that leads people to commit acts of violence, and as a minister I will do my very best to help them." There are varying reasons why people commit acts of violence. Cultural dislocation and disconnection may be one - indirectly. A third framework, focusing on the role of cultural identity has, over the preceding two decades, been the dominant explanation employed to account for the ethnic asymmetry in child maltreatment rates in New Zealand. This view proposes that it is the degree of association that Māori families have with Māori kin groupings and the level of commitment they show to traditional customary practices that will influence the likelihood of Māori children experiencing maltreatment. From this perspective, strength of Māori identity in families is a protective factor for child abuse, and a lesser identification with Māori cultural domains may increase the risk of children being exposed to maltreatment. Intervention guidelines for child abuse have therefore been specifically developed for Māori, by Māori. These focus on determining the levels of affiliation Māori families have to cultural domains and the strength of cultural identity of individuals who reside in the family. Reattachment of Māori families to cultural domains and customs has therefore become a key feature of current child abuse intervention efforts. This has recently been tested however. Researchers dividied 1,011 21 year-olds into non-Maori, sole Maori and Maori/other group according to self-identification. * listening and watching programmes in the English language about Māori (p < .001). And what did the research show? It was concluded that Maori, and in particular those of sole Maori cultural identity, were at higher risk of exposure to physical punishment and inter-parental violence, and that the associations could not be fully explained by either socio-economic deprivation or exposure to family dysfunction in childhood. Which throws a very large spanner in the works for Tariana Turia's assumption about cultural "dislocation and disconnection". "The government who robs Peter to pay Paul can always depend on the support of Paul," George Bernard Shaw once said. ...Frederic Bastiat, the great 19th-century French economist, defined the state as "that great fiction by which everyone tries to live at the expense of everyone else." I don't know if he envisioned one half of the population living off the other half. I tried it, I liked it, you will too!! Most people don't know how the official unemployment rate is calculated. Most are surprised when they find out. The government, via Statistics New Zealand, conducts a survey called the Household Labour Force Survey. Citizens are recruited into the survey and must participate for two years. Every three months they are phoned and questioned about their work habits and those of other household members. Through the questions it is ascertained whether or not the participant (and any other adult members of the household) is employed. At any given time 15,000 households participate. The current official unemployment rate gleaned from the survey is 6 percent. The unemployment rate is not a reflection of people registering at Work and Income. If it was, the number would be considerably higher. For instance, at June 2009 310,000 working-age (18-64 years) people were receiving a benefit (unemployment, sickness, invalid or domestic purposes, etc). That represents around 12 percent of the working age population or 1 in 8 people. There is good reason to assert this figure is a better representation of the true unemployment rate. Regardless of the reason somebody is reliant on welfare they are unable to support themselves through paid work or other means . They are not employed. It would also be a fair suggestion to add to this figure those people who are long-term ACC claimants. During the year to June 2008 there were around 108,000 people claiming weekly compensation from ACC; 23,000 had been receiving compensation for 1 year or more. If last year's figures are similar, that would add another 1 percent the 12 percent who are on benefits. Perhaps an accurate unemployment rate hovers around 13 percent. Certainly there is nothing scientific about these rough calculations . But they serve to show that an unemployment rate of 6 percent is not telling us a great deal about the ratio of dependent working-age people to non-dependent. Prior to the creation of the HLFS the only source of information about unemployment was the census or the number of unemployment benefits claimed. It is rather sobering to take a look at what those figures looked like in the mid-1960s. 5,125 males were unemployed on census night in 1966. Most of the unemployment must have been a temporary affair however given that throughout the sixties there were only ever a couple of hundred people on the unemployment benefit. In 1965 there were only 28,000 people receiving working-age benefits - the majority, a Widow's benefit. There was no ACC. The population was around 2.6 million. Fewer than 30,000 dependent people then, compared to over 300,000 today. A ten-fold increase with less than a doubling of the population. How the world has changed. New Zealand's modern benefit system reminds me of the famous quote, "Build it and they will come. 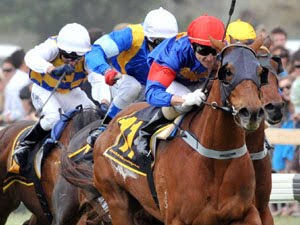 Guess who owns this up and coming horse? Speeches by politicians are best avoided in my experience. Full of banal, platitudinous, dreary waffle. But I rather liked this one from Rodney Hide, quoting John Stuart Mill in an effort to get his audience, the NZ Companion Animal Conference, thinking about some basic principles. I stand for freedom. I take the view, and apply it as Minister, that less government is good government. I think government should leave people as free as possible. I believe hand-in-hand with individual freedom comes personal responsibility. Too many people want to be free to do as they please but then aren’t prepared to accept the consequences of their own decisions and actions. They prefer to offload the consequences to others. The fact is we can’t enjoy individual freedom unless we also accept personal responsibility. This belief is probably more popular in the abstract than in everyday life. Faced with any problem, an awful lot of people immediately think that ‘there should be a law against it’. And an awful lot of legislators, listening to the people as they should, agree, and pass a law against it. Sometimes, this law works, and things get better. But mostly it doesn’t. I think the lowering of road deaths is an example of stronger laws and heavier enforcement producing a good result. Sure we have had to accept random breath tests, but our roads are undoubtedly safer as a result. That’s a small price to pay for reducing the carnage on our roads. My belief in the need for individual freedom and personal responsibility impacts directly on my job as Minister of Local Government, which includes consideration of the country’s dog laws. I want to announce today that I have asked officials to begin thinking about a first-principles review of the dog laws. I have not asked that this be a priority, because I think the government has more important things to do. But I expect that sometime in 2011, you may be asked for your views. In the meantime, the present laws will apply, although I hope that local authorities will work hard to ensure the emphasis is on freedom, rather than restriction. I do not know what will emerge from such a first-principles review. In the lead-up to it, we can all do some thinking. Here’s mine: John Stuart Mill, the great 19th-century advocate of freedom, was responsible for what we know as the ‘harm principle’. It says 'the sole end for which mankind are warranted, individually or collectively in interfering with the liberty of action of any of their number, is self-protection'. Unfortunately the only benefit statistic released was the unemployment benefit. It is nevertheless good news that fewer people have needed to resort to the dole. Disability benefit receipt has almost doubled in Australia since 1990, with the biggest growth among the working-age population. Better keep them away from NZ or they'll be nagging us too. The number of people receiving a sickness or invalid's benefit here has almost trebled since 1990, from 47,000 to 140,000. I wonder if Paula mentioned that last week when she was in Paris detailing to other employment Ministers at an OECD-hosted meeting how well NZ does in keeping people off benefits. What was it she said again? "Unlike other countries, we don’t hand over a benefit and then offer to help someone find work." Young people who have grown up in welfare-dependent families are disadvantaged in more ways than has previously been realised, a study shows. ..."People have suspected these differences but I'm not sure we knew of the extent of the disadvantage and the breadth," Professor Cobb-Clark said. Specific measurements of various differences are provided. Frankly, unlike Professor Cobb-Clark, I am surprised that the differences weren't greater. It may be that there is a positive bias because participation in the survey was voluntary so the sample is a more motivated group. "Welfare campaigners this week lobbied the government to lift unemployment benefits, after the OECD revealed that more than half the jobless households in Australia are ‘poor’: with incomes less than half of the median. But acting Prime Minister Julia Gillard did not take the bait, standing by the government’s decision not to increase unemployment benefits and payments for sole parents in this year’s budget. Gillard was right to stay firm. More work, not more welfare, is what these families need to improve their economic situation and the well-being of their children. One in eight kids now lives in a jobless household. Most of us instinctively appreciate that the striking disadvantage they face extends well beyond the purely economic. Fairfax’s Adele Horin reported yesterday on new research from the Youth in Focus study released at the Australian Conference of Economists this week. It highlights just how destructive welfare and parental joblessness is for these kids. If welfare rights campaigners who this week attacked the government really want to improve the lives of those they claim to help, they could start by recognising that making welfare more attractive will only intensify their problems." The destructive practice of paying women to have babies with casual acquaintances is starting to permeate the collective consciousness of the UK population. Even PM Gordon Brown is starting to talk about the ill-advised policy that pays 16 and 17 year-old mothers to live 'independently' in council flats. A friend has just returned from the UK. She brought with her an article from the Daily Mail, knowing I would be interested. Fortunately it is also on-line. Here I will excerpt pieces and draw New Zealand parallels. Machetes by the door, drugs on the table - and mothers paid by the state to have babies with men they barely know. What HAVE we done to the British family? It's the most destructive crisis of our age - a generation of violent, illiterate, lawless young men living outside civilised society. New Zealand - A prison population at an all-time high, convictions for violence at an all time high, gangs that are getting more vicious with no shortage of newcomers. It always started the same way, he said: he'd start seeing a woman, and she'd tell him she was on the Pill. Then two weeks later: 'Bang, she gets pregnant.' There was never any discussion about the pregnancy. As far as he was concerned, they were barely an item at that stage - and they were certainly not about to move in together. So why did these women choose to have babies by a man they barely knew? Prince, who is 37, laid the blame squarely on benefits: 'Women get money from the Government; men get eradicated. What do you need a man for? The Government has taken our place. Politicians, for their part, blame the rising numbers of troubled children on the breakdown of the family and the absence of fathers. This is a fundamental mistake: they are presuming there is a family in the first place. Above all, the Government needs to recognise that benefits are a powerful incentive, particularly for young girls. For the past few years, Britain has had the highest rate of teenage pregnancy in Europe, with 90 per cent of births occurring outside marriage. The British teenage birth rate (27 per 1,000 15-19 year-olds) is behind New Zealand's at 32 (and for Maori it rises to 80). There is a marked correlation between the high Maori teenage birthrate and high Maori crime rate. An overhaul of the benefit system is clearly at the heart of transforming the lives of disadvantaged children. But to accuse their mothers of being feckless is unjust: they are merely responding to the economics of the situation. They have grasped the consequences of our poor education system better than our politicians ever have. Last year, less than half of teenagers finished compulsory schooling with five good GSCEs that included maths and English. Of those, the ones who do worst of all are children from lowincome families. Then what happens? The boys take to crime - and the girls get pregnant. Incredibly, more than a quarter of British children are now raised in single-parent families - and nine out of ten of them are headed by women. At the last census 28 percent of New Zealand families with dependent children were headed by a single parent - eight out of ten are women. Male single parenthood is more common among Maori probably accounting for the gender difference with the UK. What future is there in Britain today for a girl without qualifications? Skilled and hard-working immigrants now monopolise menial jobs, and the next step up - a job, for example, in catering or hairdressing - pays about £10,000 a year before tax. Which is slightly less than a girl with two children receives in benefits, and without the incentive of somewhere to live rent-free. In other words, if you were in well-paid employment, with good prospects, there was no reason to have children. The average income for 18-24 year-olds is $384 - below the average income of a single parent on the DPB. In New Zealand around 5,000 babies are added to an existing benefit each year. Many single mothers are excellent parents, of course. But the Government has put disadvantaged girls in a position where the only career open to them, the only possibility of an independent life, is to have children - whether they want to or not, whether they are likely to be good mothers or not. The state, as Prince pointed out, has indeed taken over the role of both husband and employer. With a combination of financial incentives and poor schools, it is ensuring a steady supply of babies who start life with all the factors in place to become the next generation living on benefits or the proceeds of crime. What is the Government doing about this cynical cycle of deprivation? Over the past few years, it has come up with a plethora of schemes to intervene ever earlier in the life of a disadvantaged child. In other words, it has concentrated on the consequences of single parenthood - but not the cause. Ditto, ditto, ditto for NZ. Last week the latest was announced. Getting parents back into the class room to teach them how to raise their ill-disciplined children. What is the point of setting targets to end child poverty when the Government's policies are creating tomorrow's poorest children - and grandchildren? Exactly. See my post about the Maori Party targets to end child poverty. So why hasn't the Government reformed the benefit system? It's as if they're offering car drivers a bonus for every crash - then acting surprised when accidents shoot up. Good analogy. Cash is offered to teenagers to have babies and then hands are rung over the rising teenage birthrate. The only defence of this stupidity is that the two are not related. Yet research has shown the two are related. The absence of a male role model has a particularly profound effect on disadvantaged boys during their teenage years. A third of 14-to-25-year-olds questioned for a survey by the Prince's Trust did not have a parent whom they considered a role model. More than half said they'd joined a gang to acquire a sense of identity, while a quarter said they were in search of someone to look up to. These boys are unlikely to find male role models in schools. The number of male teachers has slumped to its lowest level in at least 20 years; and in primary school, 85 per cent of teachers are female. Even in youth offending teams, women make up the majority of the staff. This year, according to the latest research, one in three children who live with a single mother will spend less than six hours a week with a male role model - whether a father figure, relative or teacher. All the odds are stacked against them. Even children on the 'at risk' register are five times more likely to have single teenage mothers - as Prince knows all too well. Two of his children, he discovered recently, were being neglected by their 19-year-old mother. Social services removed the children and gave them to their maternal grandmother to bring up. But Prince's ex-girlfriend, he says, has made no attempt to get her children back. 'Prince' is no prince either. His holier than thou tone is somewhat derisible. But he is spot on when he sums up the situation. The government has usurped fathers and the vital role they play, causing massive social problems. And that is no less true in this country.